Law School throws everything for a loop... and I mean everything. Biggest thing that has been lacking since I started Law School: my health. With my erratic schedule (stay up until midnight, up at 5:30 during the week, sleep until 10 on weekends), making a point to eat healthy, drink enough water and maybe sneak a workout in is a struggle. I have made a resolution to really get things under control this new year and now as I am in my 5th month since starting Law School, I have finally figured out a plan that is a bit more healthy. Here are my tips for staying healthy in Law School. I have always struggled with drinking a proper amount of water. I never seem to drink enough and all I ever read/see/hear is how good drinking water is for you. Since starting Law School, I have made a point to drink more and my trusty Camelbak bottle goes EVERYWHERE with me. I have been doing a lot better about it and the only downside is I always have to pee (thank goodness for mid-class breaks). I have noticed that I have more energy, my skin is more hydrated, I boredom-snack less and I get less midday headaches with my increased water intake. I highly suggest upping the h2o to feel more healthy; especially on longgggg days on campus. For the first few weeks of school, I was always throwing my lunch together last minute (easy mac) or running out for fast food. This was not healthy. I finally got my life together, bought a lunch box and started packing the night before. I buy lunch-y items at the store for the week and I am set to throw it all in my lunch box before bed. My lunch usually consists of a sandwich or dinner leftovers, vanilla yogurt, a fruit or vegetable, something sweet and a V8 Energy juice. That gives me enough for a solid lunch and a snack for the longer class days. Not only is it cheaper and healthier to pack a good lunch, it makes me feel like I have my life together just a bit. Overall, this is a big help. Maybe my law school is unique but there is an abundance of stairs. I have classes on the first floor, my locker on the second, the library is the second/third and study rooms are the 4th. As much as the elevator usually appeals to me, I try to make a conscious effort to take the stairs as often as possible. It's not much but it is better than nothing... and I pant a little less at the top as I did when I started school so that has to mean something. This is what I struggle with the most... when I get home from class, the last thing I want to do is work out. I have found Yoga to be my best bet and something I actually look forward to. I find it very relaxing and it helps immensely with the tight muscles in my neck and upper back from bending over desks and books all day. It gives me a nice little burn and the flexibility it a work in progress. My husband and I are also in the process of buying a used stationary bike for our basement- this will be great because I can prop my casebook up on it and cycle away while I read. As much as I never want to, squeezing in even a short workout makes me feel so much better (because remember, as queen Elle said, exercise releases endorphins and endorphins make you happy and happy people don't kill their husbands) and like I have my crap together. Sleep... we have a love/hate relationship. I am a mild insomniac so falling asleep is a battle every night. As a result, I have always been a nightowl and I loveeee me some sleeping in in the morning. However, I get up at 5:30am with my husband every morning to send him off to work so I have been working at earlier bed times. I am a big fan of natural sleep helpers: Sleepytime Tea is always a great help and taking regular Melatonin vitamins has helped to regulate my sleep schedule. 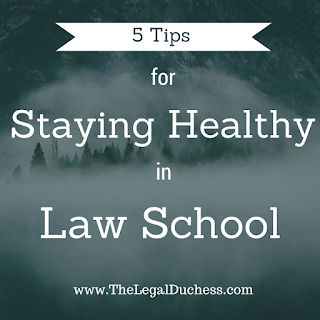 Having a good nights sleep is so important to your overall health, especially in Law School. You need your brain to be in tip top shape and a good night of sleep is a great first step. Those are just a few of the ways I have used to try to stay healthy during this crazy rollercoaster that is Law School. What do you do to keep healthy? 100% agree. I’ve tried to understand the benefit of healthy law school, but just don’t get it.